Racial and ethnic minorities accounted for 20% of all public elementary and secondary school teachers in the United States during the 2015-16 school year, according to data from the National Center for Education Statistics (NCES). That makes teachers considerably less racially and ethnically diverse than their students – as well as the nation as a whole. Nonwhite teachers not only were sharply outnumbered by white teachers in America’s classrooms, they also tended to work in different school environments, the NCES data show. For example, 31% of teachers in city schools were nonwhite, versus just 11% of teachers in rural schools – a reflection of the broader racial and ethnic makeup of America’s communities. And while nonwhite teachers accounted for 29% of the total in public charter schools, their share was considerably lower in traditional public schools (19%). In addition, considerable shares of teachers were nonwhite in schools with higher percentages of students eligible for free or reduced-price lunch. (Such eligibility is often used as a proxy measure for lower household income.) Nonwhites represented 34% of teachers in schools where at least three-quarters of students were eligible for free or reduced-price lunch. In schools where a quarter or fewer students were eligible, just 11% of teachers were nonwhite. 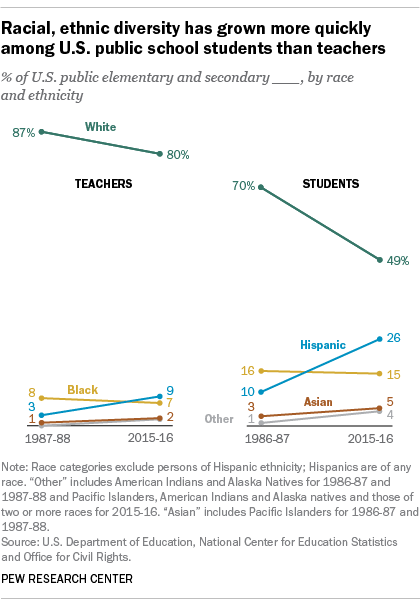 While only one-in-five of America’s public school teachers today are nonwhite, this share has increased since the 1987-88 school year (the earliest with comparable data), when about 13% of teachers were nonwhite. Hispanic and Asian teachers have accounted for much of the growth during that span. While the number of black teachers also has increased since the late ’80s, the share of black teachers has declined. In the past 30 years, Hispanic teachers have overtaken blacks as the second-largest racial or ethnic group among U.S. public school teachers. In 1987-88, there were about three times as many black public school teachers (191,000) as Hispanic teachers (69,000). Since then, the number of Hispanic teachers increased about fivefold to 338,000, while the number of black teachers increased by 34%, to 256,000. And while Hispanics still account for just 9% of teachers overall, they have accounted for a sizable share (18%) of the growth in teachers since 1987-88. Meanwhile, the pattern in racial and ethnic diversity among principals is similar to that of teachers. Nonwhites made up 20% of U.S. public school principals in 2015-16, a share that has grown since 1987-88, according to another NCES survey. Much of this growth can again be attributed to Hispanics and Asians, who have both doubled in number. Though Hispanics and Asians still account for very small shares of all principals (8% and 1%, respectively), they accounted for much of the growth among principals since 1987-88. Growth in racial and ethnic diversity has been much faster among U.S. students than among both teachers and principals in recent years. During the 1986-87 school year (the earliest year with comparable data), three-in-ten students were nonwhite, but that share increased sharply over the next three decades. Growth has been especially fast among Hispanic students, from 10% of students in 1986-87 to 26% in 2015-16. It’s worth pointing out that U.S. public school teachers look different from students not just in terms of race and ethnicity, but in terms of gender. In 2015-16, roughly three-quarters of all elementary and secondary teachers were women, while students are nearly evenly split between boys and girls. For this analysis, “nonwhite” in the 1986-87 and 1987-88 school years includes blacks, Hispanics and Asians (including Pacific Islanders), as well as Native Americans and Alaska natives. Due to methodological changes in NCES data, “nonwhite” in 2015-16 also includes people of two or more races, while Pacific Islanders were counted in a separate category from Asians.